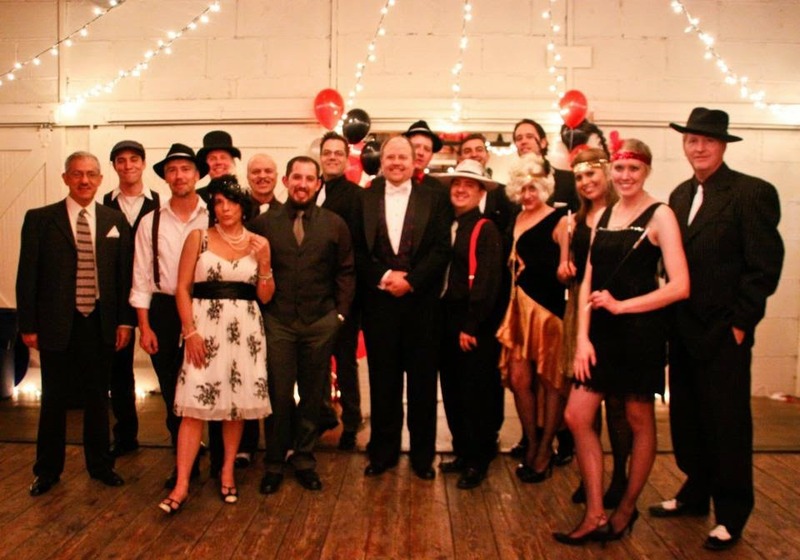 Postmodern Company Celebrates Their 20th Anniversary By Throwing a Fundraiser Gala! On October 20, 2012 Postmodern Company (PMC), led by David Emrich, President of Postmodern as well as historian and author of Hollywood, Colorado, a history of filmmaking in Colorado in the early 20th century, roared into its twenties by hosting over 200 clients, colleagues and friends for a night of 1920's themed festivities. This year, PMC celebrated 10 years in the RiNo Art District, and 20 years serving the Denver creative community. In conjunction with the party, PMC held a silent auction that raised over $2,000 for the Colfax Community Network, and guests donated a substantial amount of crafts and education supplies to the Resource Area For Teaching (R.A.F.T.) organization. Emrich, an industry veteran, founded PMC in 1992. A second-generation film professional and third-generation Denver native, Emrich followed in his father's footsteps through the backdoor of the film business. 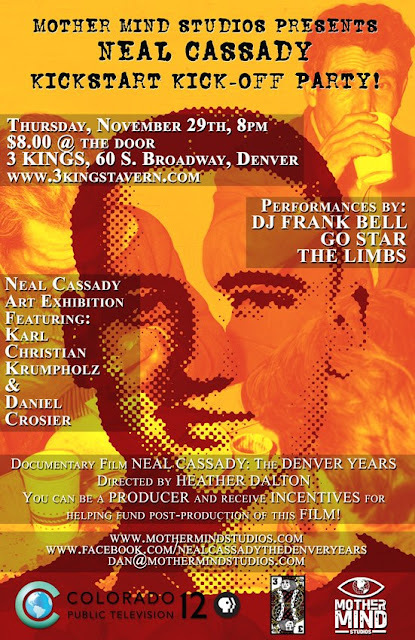 His father, Paul Emrich, a 40 year film sound-man, was a decades long fixture at Western Cine, a film lab in Denver. Since 1992, PMC has evolved into a one-of-kind partner for agencies and corporate marketing departments in the Denver region. “Under one roof, we provide our clients with creative production, editorial, color, motion design, sound, and radio. Additionally, we’ve expanded our offerings to include a robust content management and distribution platform called Postmodern Labs” Emrich notes. This arrangement provides clients with tremendous efficiencies in time and money. PMC has worked with clients on commercials, web video campaigns, documentaries interactive media and feature films. It is this diversity that allows the company to thrive in a competitive production and post-production world. The company works on more than 100 projects a year with clients such as JWT, Bellco Credit Union, Redstone College, the National Science Foundation and Bechtel, among many others. Emrich and the team have built up a large clientele in Colorado, much like Hollywood built itself -- through film connections and developing a name in the business. In the spirit of increasing the value provided to clients, Emrich recently hired Director of Commercial Business Development, Dave Momper and several tenured producers, including Ben Seymour, to help with the company's expansion. With the recent passing of Colorado Film Incentive bill, HB12-1286, Emrich admits to having a very big vision for film in Colorado – re-establishing the state as a national production and post-production front-runner and Denver as a prominent city in the film industry. 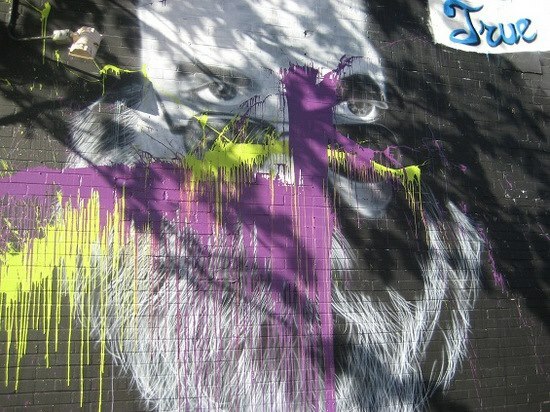 "Denver is a brilliant city," Emrich said. "My mission, in a way, is to get people to realize there is a rich pool of technical ability here for making and editing films." After all, historically, Colorado was making films 10 years before Hollywood existed. For more information on Postmodern Company contact Dave Momper at DavidM@postmodernco.com, or 303.539.7001. Postmodern is located at 2734 Walnut St., Denver, CO 80205 and on the web at www.postmodernco.com. After introducing Colfax Corridor Connections in September 2012, the project team gathered community input throughout the fall to help inform the transit and mobility study. Technically known as Public Scoping, this phase defined the study and sought input on the challenges and opportunities for improving transportation in the East Colfax corridor. "Community engagement is essential to the success of this study," said Terry Ruiter, Colfax Corridor Connections Project Manager with Denver Public Works. "Public workshops will be held during each of the four project phases. These meetings will provide details and seek input on the alternatives being evaluated to improve mobility, accessibility and livability for transit users, pedestrians, bicyclists and drivers." To kick off the study, the Colfax Corridor Connections team conducted extensive community outreach and collected input that will shape the study's focus and inform its decisions. Public workshops were held on October 1st and 4th, 2012, in both Denver and Aurora with nearly 100 participants providing more than 125 comments over the course of two evenings. The East Colfax corridor is increasingly congested for all modes and this project is needed. Transit stations and vehicles should be safe, clean, comfortable and easy to access. Although the study area is an urban environment, the study should consider environmental factors, such as trees, water and air quality. Many related projects and studies have been conducted in the area and Colfax Corridor Connections should consider and build off of them. It is important to maintain the unique character of Colfax and consider how transit users, pedestrians, bicyclists and drivers access the corridor and move within it. Denver Public Works, in coordination with the Regional Transportation District, the Denver Regional Council of Governments, the Federal Transit Administration and the City of Aurora, has now begun the preliminary analysis of transportation alternatives for the corridor. The initial findings will be presented at public workshops in early 2013. Between now and next fall, increasingly detailed evaluations of alternatives -- including public input as one of many criteria considered -- will be used to identify and recommend one or more solutions that best meet the mobility needs of the corridor with the least environmental impact. By identifying solutions now, the City and its partners will be able to make informed decisions that work toward a broad, cohesive and sustainable plan for the future. Question: What transportation alternatives are being considered? Answer: Colfax Corridor Connections is evaluating many transit and multi-modal alternatives. Potential options include revised operations of existing transit routes, use of larger buses, bus rapid transit (BRT), transit-only lanes, streetcar service, light rail, bicycle and pedestrian improvements and more. Combinations of options will also be used to create alternatives, such as enhanced bus service with pedestrian and bicycle improvements. Q: What factors are taken into consideration when evaluating alternatives? Answer: The study's multi-level screening process considers more factors and more detail in each phase of evaluation. The current, preliminary screening phase, conducts a pass/fail analysis to identify solutions with no reasonable chance for implementation. Those that have a "fatal flaw" -- because of cost, irresolvable impacts or technical challenges -- are eliminated from further consideration. During the more detailed levels of evaluation, in-depth quantitative analyses are applied, such as community and environmental impacts, cost-effectiveness, projected ridership, local land-use plans and how the alternatives would improve mobility in the corridor. Public support is another important evaluation criteria considered in the evaluation of alternatives. Q: Will there be construction? When will it start? Answer: Not yet. Colfax Corridor Connections will identify an action or set of actions that can be taken to meet transit demand and improve mobility in the East Colfax corridor. This action, or set of actions, would become part of a long-term, cohesive and sustainable transportation plan and implemented as funding becomes available. Q: What is the best way for me to get involved in this study? Answer: Public input is vital to making decisions that are in the best overall interest of the communities within the East Colfax corridor. Public workshops will be held during each of the four project phases, with the next meetings tentatively scheduled for early 2013. To get involved and receive project updates, visit www.ColfaxCorridorConnections.com, email the project team at Info@ColfaxCorridorConnections.com or call the project hotline at (303) 223-6595. 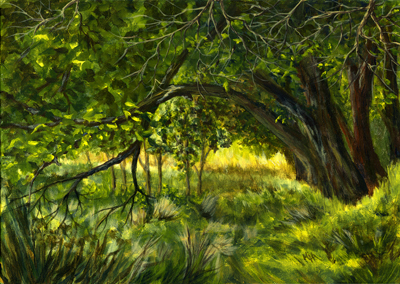 At the next Art Walk on the Fax (2nd Fridays every month in the Aurora Arts District) join House of Flowers in welcoming their newest artist, May W. Yipp, who moved to Colorado in 1997. After a long career teaching biology in Hong Kong, she decided to take a different path and began taking drawing classes, a natural development from the scientific illustration work she had done. This led to painting classes by 2000. In the beginning it was a personal challenge to experience something she had never done before. More classes followed one after the other, and soon she was unable to extricate herself from this new adventure. The Artist Reception is Friday, December 14th, from 5 to 8:00pm. Wine and Hors d'Oeuvres will be served. 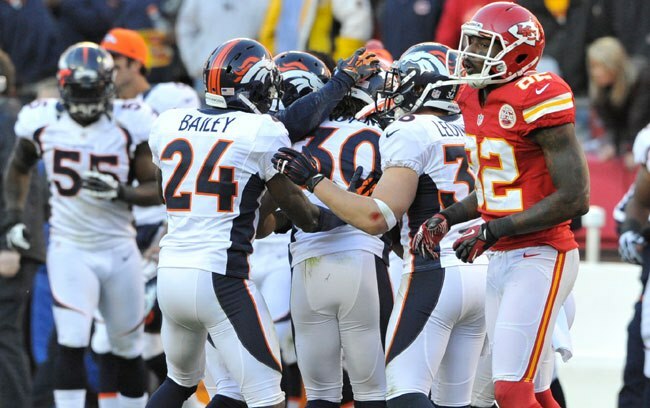 The Broncos won their sixth straight game and improved to 8-3 on the season with a 17-9 victory over the Chiefs. Watch the BTV highlights from the win here: http://dbron.co/1ak. Shop Small, Shop Local! 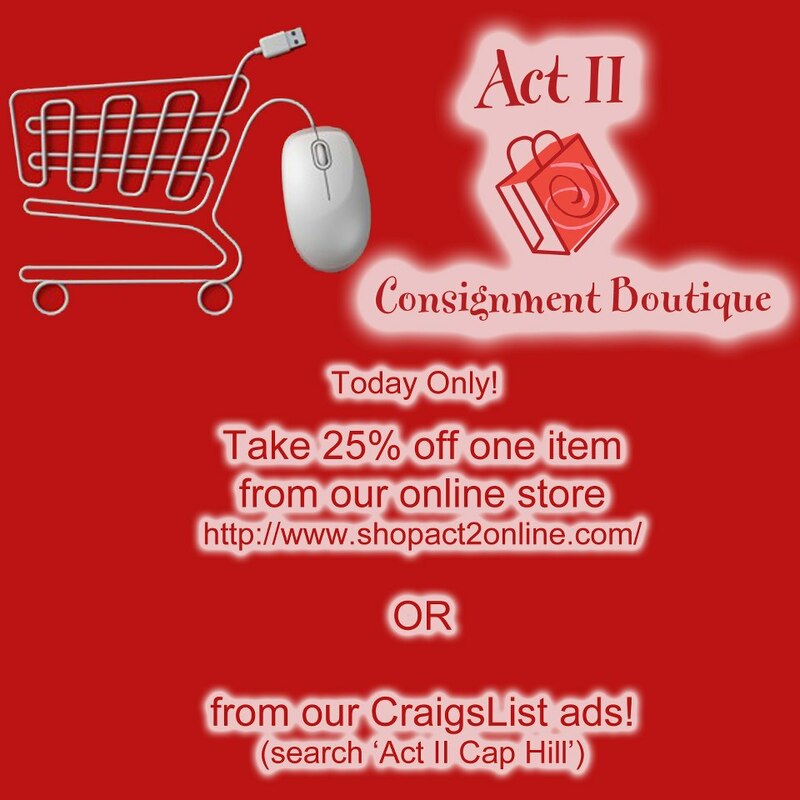 Enjoy 'Cyber Monday' with our favorite local Colfax boutique: Act II Consignment! Deals go on all day today so stay tuned as new items are posted to their website! Someone once said that Colfax Avenue is "not your grandmother's main street." 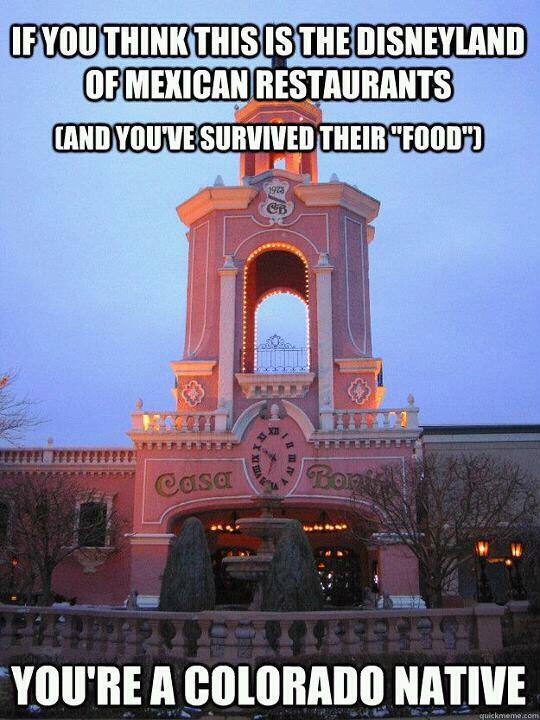 Thankfully, this is true. Colfax is colorful, original and anything but traditional. It's a place where beautiful architecture like East High School coexists with vibrant murals adorning a variety of unique local businesses. The patrons who visit these shops range from business people on lunch break and joggers making their way to City Park, to Colfax regulars who can resemble, to quote an Atmosphere song, "a cloud of tattoos, pierced body parts and colorful hairdos." As they say, "This is not your grandmother's main street." Ricky Dean, singer and guitarist of the Redline Rockets, was recently back in CCM Studios (4214 East Colfax Avenue) working on another classic country original called "Roll With The Punches". This time he brought a friend! 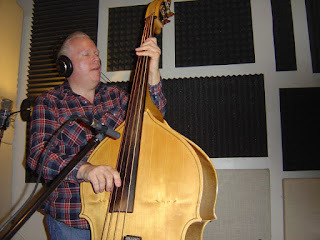 Play that bass fiddle Mike! 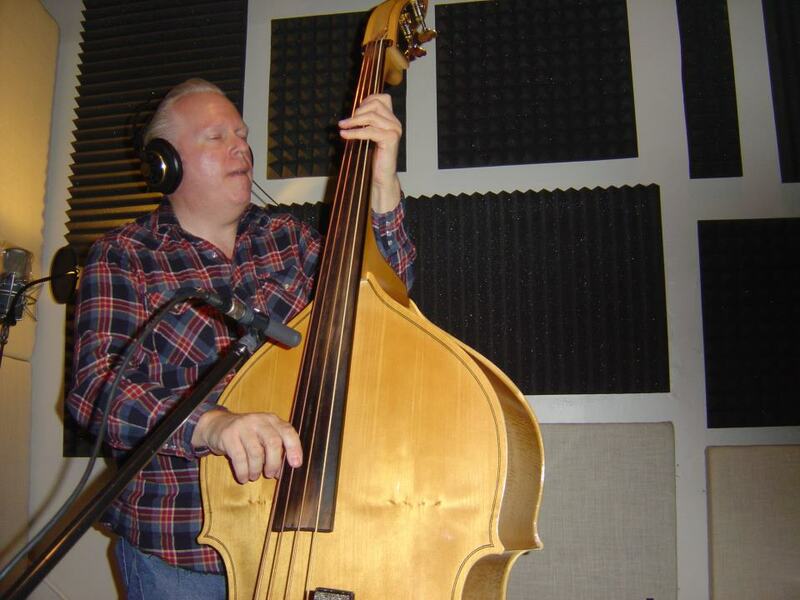 Before forming the Redline Rockets with Ricky, doghouse bass player Mike Baird cut his teeth accompanying Rock-A-Billy Record Co. label founder and Rock-A-Billy Hall of Famer Willie Lewis for many years and countless recordings. 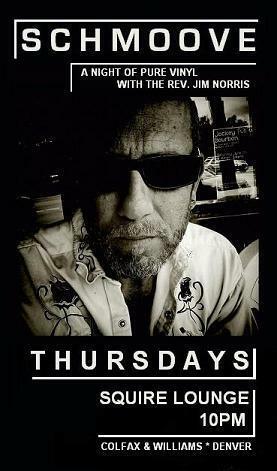 Tonight, Mike brings his traditional rockabilly sound to the Zephyr Lounge on East Colfax Avenue in the Aurora Arts District with Jonny Barber and "Mad Dog" Mike Minnick. 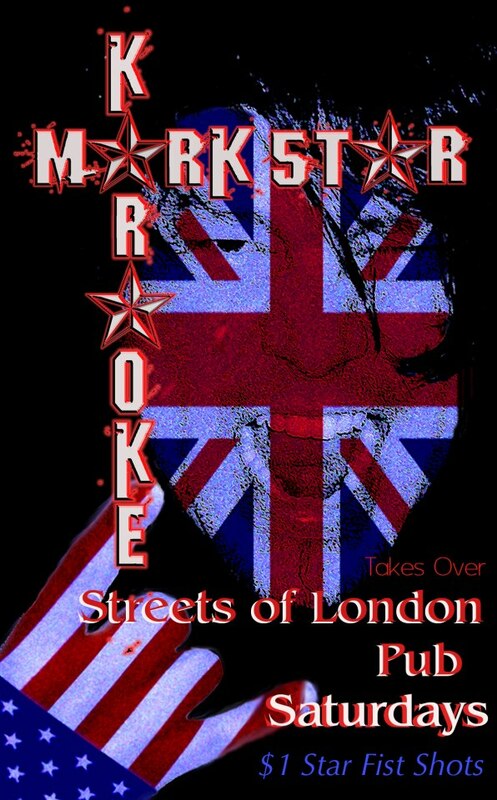 Show starts at 9:00pm and is FREE!! A Christmas Carol, as adapted by David and Julie Payne (with original music by Martha Yordy), opens at The Aurora Fox the day after Thanksgiving November 23rd. Tickets are $26 for adults, $22 for Students/Seniors, $20 each for groups of 10+ and $13 for children 12 and under. Family 4-packs are $65 (two adults and two kids). Performances are at the Aurora Fox (9900 East Colfax Avenue, Aurora, CO 80010) from November 23rd – December 16th. In Charles Dickens’ ghost story of Christmas, Ebenezer Scrooge (played by Greg Price), the most despised man in London, greets each Christmas with a “bah humbug,” until he is visited one Christmas Eve by the Ghosts of Christmases Past, Present and Future. These spirits show him happy memories from his past, cruel realities from the present and a grim future should his despicable behavior continue. 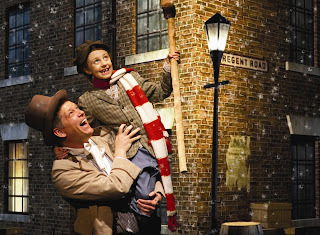 Along the way we meet beloved characters like kindly Mr. Fezziwig, beautiful Belle, and frail Tiny Tim. Discover again the power of redemption and the absolute joy of the holiday season. FOR TICKETS Call 303-739-1970 or visit www.AuroraFox.org. Join us for our annual cookie exchange and eat, drink, mix and mingle with cast/crew/staff and fellow Fox attendees following the opening night performance. Seniors get in for just $18. Hot beverages are on the house. FOX NEWS DENVER — R&B Superstar Lauren Hill was the featured performer at the Fillmore last Friday night. Jennifer Muenzenmayer and her friend Jonathan Hammond had just left when it happened. “Jonathan put me in the passenger side of the vehicle. He walked to driver`s side and that`s when he was attacked,” said Muenzenmayer. The attack happened at E. Colfax Ave. and Pearl St., just one block from Denver’s largest police precinct. Cell phone video captured the chaos as police came from every direction. Two men tried to rob Hammond, and when he refused, one of them shot him, piercing a major artery in his leg. It was the third violent crime in Capitol Hill in just weeks. As most families gather around a table Thursday, Jonathan’s family will gather around his hospital bed. “We`re thankful he lived.” They say a senseless crime taught them more about giving thanks than most people learn in a lifetime. Having recently been discharged from the military, Jonathan was in the process of completing his insurance paperwork. He was uninsured when he was shot. 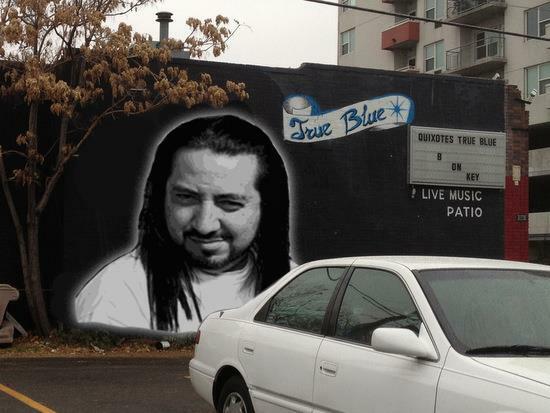 His family has set up a PayPal account for anyone who may want to help. You can make donations at PayPal. The account is under the email: JonathanMHammond@hotmail.com. 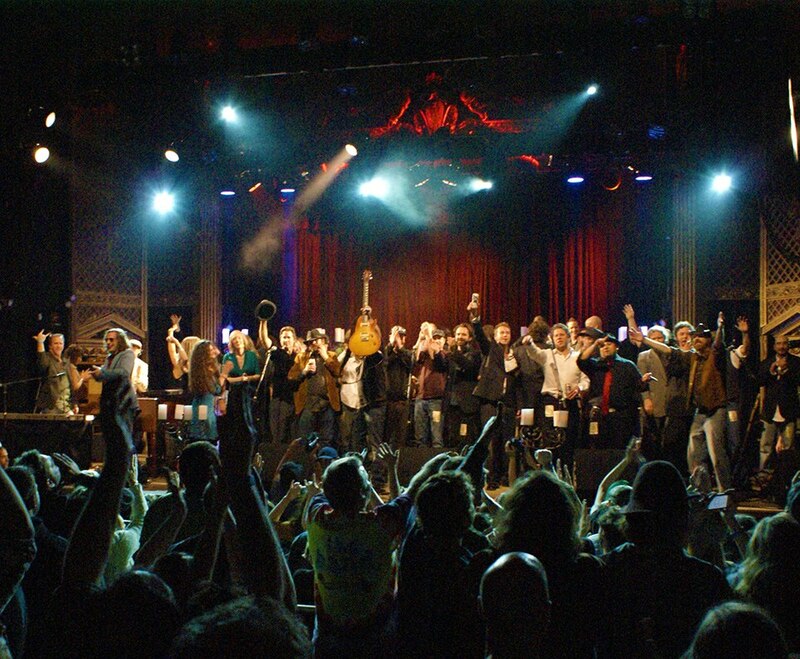 The Last Waltz Revisited at the Ogden Theatre Tonight! Back in 2005, Denver's number one jamband, Polytoxic, wanted to put on a show that could showcase all the great local musicians they had been playing with for the past few years. They decided to re-enact The Band's "The Last Waltz," a concert film by Martin Scorsese from 1978 of The Band's last performance that included all of that era's greatest musicians - Eric Clapton, Dr John, Neil Young, Joni Mitchell, etc. 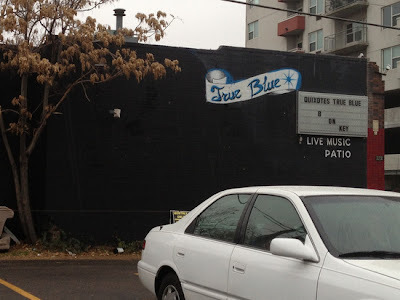 The show was held at Dulcinea's in Denver's Capitol Hill area on May 25, 2005, and Polytoxic planned on it being a fun little show that would garner a little bit of interest. 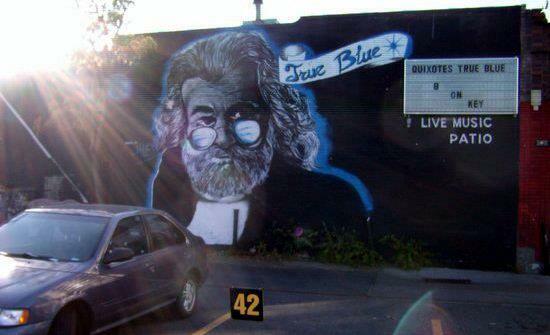 It sold out in minutes, surprising the band and fans alike, and became the biggest show they had ever thrown. So big, in fact, they decided to do it again in 2005, this time on the night before Thanksgiving at Cervante's Masterpiece Ballroom. Polytoxic's "The Last Waltz - Revisited" immediately went from a "fun little" idea at a small venue to one of the biggest events of the year. It has become an annual tradition, playing to sold-out capacity crowds. 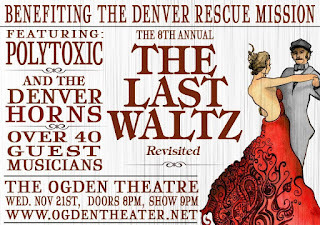 This year marks the 7th anniversary of their "Last Waltz Revisited", and it boasts over 40 guest musicians from across Colorado, a full horn section, and over 30 songs from The Bands extensive catalog, focusing primarily on songs played at The Last Waltz. The concert has become a tradition for many of those involved in the show, as well as for many of the people that come out and see the show year after year. 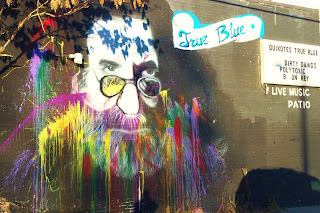 In addition, Buck Perigo will be opening the show at 9:00, performing Woody Guthrie's entire Alice's Restaurant. 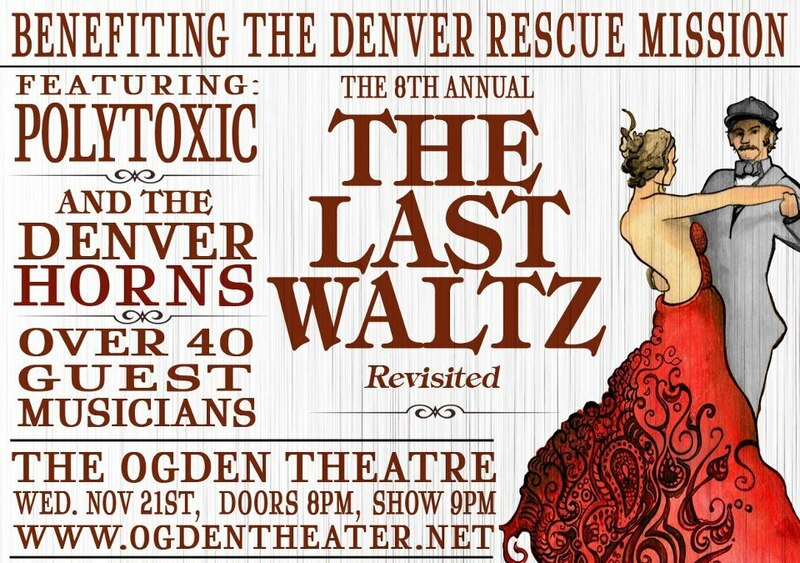 This year if our Fans bring 7 Canned Food Items for our affiliated charity, The Denver Rescue Mission, and receive a FREE Limited Edition Poster commemorating this years Last Waltz Revisited (Poster artwork by Jared Hankins Blender Design Group). As always we will be donating the food and a portion of proceeds to the Denver Rescue Mission. So come out and enjoy this magical evening, our local musicians and our local sponsors, Anthonys Pizza & Pasta, Yellow Dog Printing & Graphics and The Westword. If today was your last day on earth with your family and friends how would you live it? We should cherish everyday as if it was our last day and live life to the fullest. Don't let anger or bitterness, guilt or anxiety make you miss out on the goodness of God in the life that he has given you. Celebrate your salvation and enjoy everyday with Jesus! The 2012 Annual Thanksgiving Outreach is on Thursday November 22nd. at 10:00 a.m at Civic Center Park on East Colfax & Broadway in Denver. I (Minister Essie) will be singing along with many other guest. This event is given by Pastor Greg McDonald Evangelistic Association. A Free homemade Thanksgiving Dinner will be served to everyone. Tune in to my radio show "It's More Than A Song- It's The Life I Live" every Thursday at 11:15 a.m on KLDC 1220 AM radio station. Or stream online at www.1220kldc.com. I will play songs from my Cd's and minister a encouraging word from the Lord just for you. 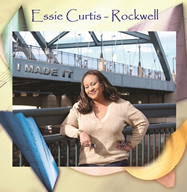 I have a new CD out 'I MADE IT'. On this release there is anointed music that reaches into your heart with a powerful message in every song. From the uplifting Gospel sound in 'I'M SAVED' you can put on your shouting shoes and dance for joy and get your Praise on and Satan has to flee (Romans 10:9,1). Tyler Ward has transformed his life and music in the last two years from living in his parent's basement in Colorado, to living in his parent's basement as an industry leader for the new wave of music. Currently, ranked as the 26th Most Popular Musician on YouTube with over 920,000+ subscribers, Tyler releases one new video each week. Combining original music, covers, and showcasing featured artists, Tyler's passion is to connect with people through music. 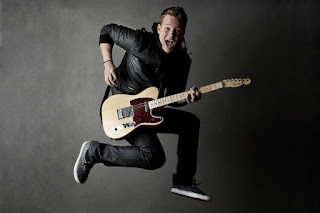 Tyler’s realization of becoming a successful national artist arose when he first started playing with national acts such as The Fray, The Jonas Brothers, Gavin DeGraw, Augustana and Ryan Cabrera. “After that first big show with The Fray, I was sold on doing music for the rest of my life,” says Tyler. Playing shows for thousands of people fueled Tyler’s drive and creativity. In February of 2010 Tyler decided to cover the massive hit "We Are The World" during the Winter 2010 Olympics. In the first week Tyler received 1.5 million views, and his career changed forever. Now with over 270,000,000+ views, Tyler has broken into mainstream music, and the charts. Tyler was the first independent musician to be charted on Billboard's SOCIAL 50, and has maintained status for 40+ weeks. Rubbing shoulders with the likes of Lady Gaga, Britney Spears, Justin Bieber, and Rihanna, Tyler has been ranked as high as #14 in the world and currently holds the #4 position on Billboard Uncharted (ranked over 50 weeks), and connects with over 540,000+ fans on his Facebook page. In 2010 Tyler also expanded his desire to work with other artists. With the inception of Tyler Ward Records and Tyler Ward Studios, Tyler is giving other artists a chance to be heard by hundreds of thousands of people every day all over the world. In late 2012, Tyler will begin his second world tour in Europe and North America. The Aurora Fox is proud to present the regional premiere of Wooden Snowflakes by Catherine Bush. Tickets are $26 for adults, $22 for Students/Seniors and $20 each for groups of 10+. Performances are in the Aurora Fox Studio Theatre (9900 East Colfax Avenue, Aurora, CO 80010) from December 7th – December January 6th. 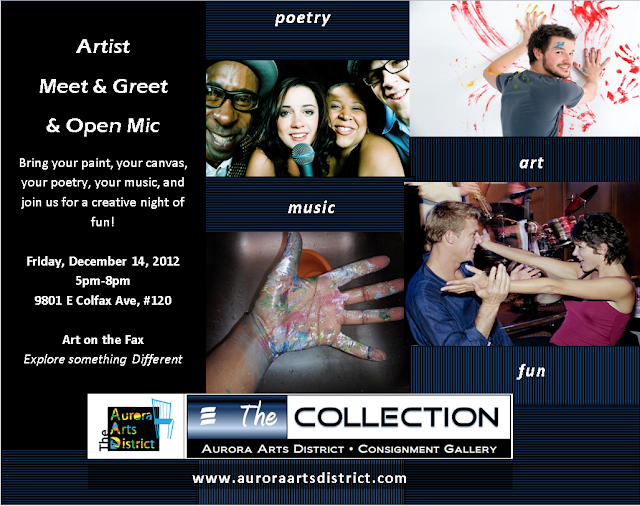 Call 303-739-1970 or visit www.AuroraFox.org. Life has left forty-year-old Eve Lawson (Patricia Wells) bitter and cynical. She refutes not only the existence of God and true love but also any belief in America’s favorite folk hero, Santa Claus. When her car slides off an icy road on Christmas Eve, she finds herself seeking shelter at the home of Simon Peter Whitaker (David Blumenstock), woodcarver and Christmas expert nonpareil. Simon wholeheartedly embraces the magic of the season and everything it entails, including belief in the “jolly old elf”. As the night unfolds, Simon and Eve find themselves clashing time and time again, sharing stories they’ve never shared, and ultimately rediscovering the warmest feeling in the world – the magic of Christmas. PRODUCTION DATES – Fridays (December 7, 14, 21, 28 and January 4) at 7:30 pm; Saturdays (December 8, 15, 22, 29 and January 5) at 7:30 pm; Sundays (December 16, 23, 30 and January 6) at 2:00 pm. 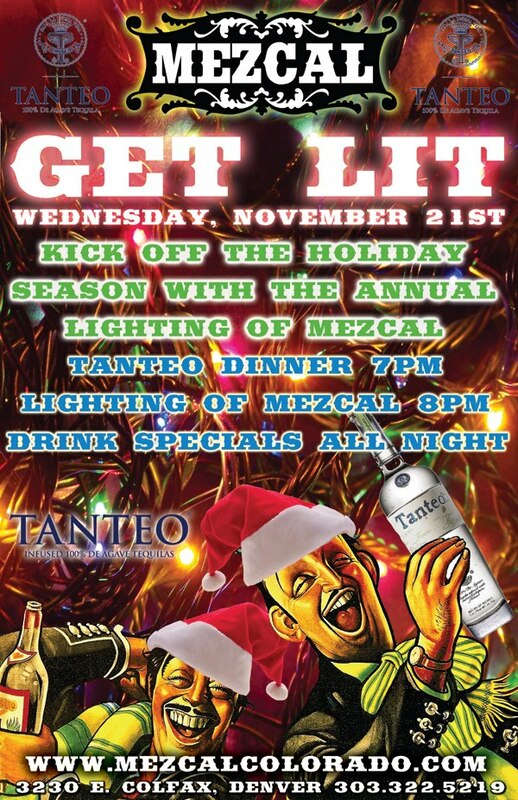 There will be an Opening Night After-Party on December 7th. Audience members are welcome to join us for s’mores and hot chocolate in the parking lot and mingle with the cast after the show. PAY WHAT YOU CAN PREVIEW – Thursday, December 6th – 7:30pm. Join us for our final dress rehearsal. Admission is “pay what you can”. SUPER SENIOR SUNDAY – Sunday, December 16th, - 2:00pm. Seniors (age 60+) get in for just $18. Hot beverages are on the house. 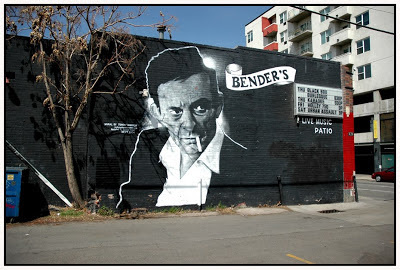 Arts & Venues Denver is seeking an artist, or artist team, for a site-specific public art commission that compliments the street improvements made along East Colfax Avenue between Grant Street & Columbine Street. The selection panel has recommended a free-standing artwork for the site located near the intersection of Colfax Avenue, Franklin Street and Park Avenue. This commission is open to Colorado artists/artist teams working in all media. 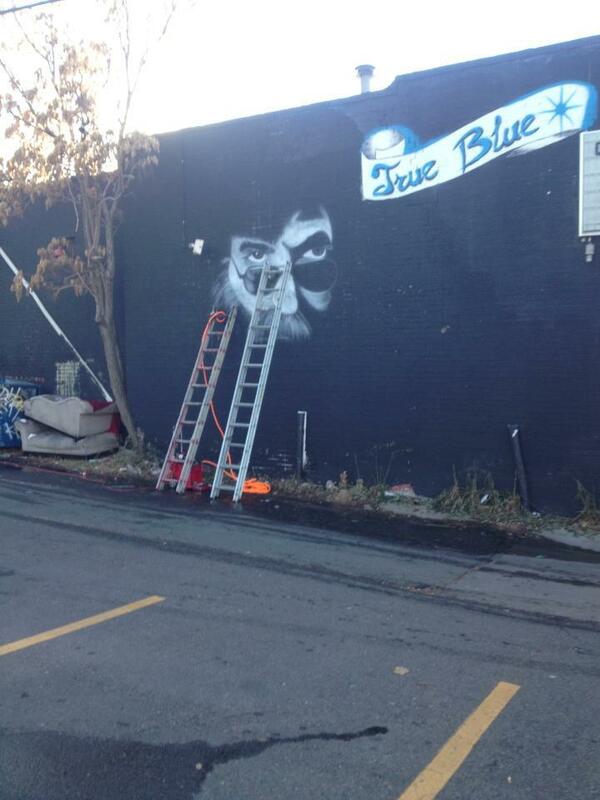 Estimated budget for artwork is $23,000. Deadline is Friday, November 30, 5:00 PM MST. 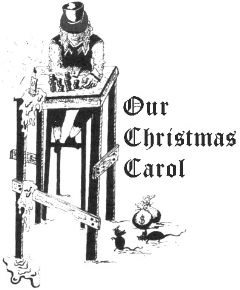 “Our Christmas Carol” ….is adapted from Charles Dickens timeless story, first published in 1843. Mr. Dickens would probably recognize his story and his characters, but one hopes that he would also be delighted with this humorous interpretation of his work. Our small group of comedic professionals put a hilarious twist on the story that is not seen anywhere else in the metropolitan area. 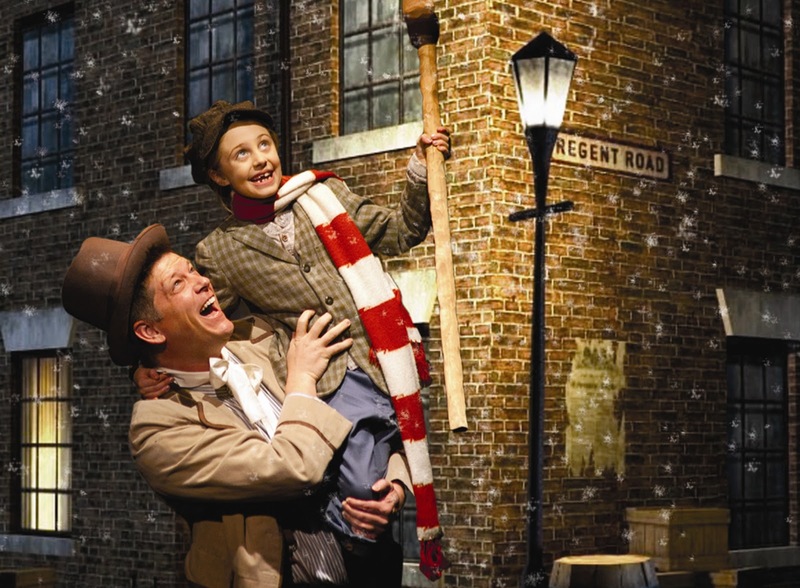 Following the play is our famous Christmas Review, featuring music (both sacred and secular) and comedy that is guaranteed to put you in the Christmas Spirit. 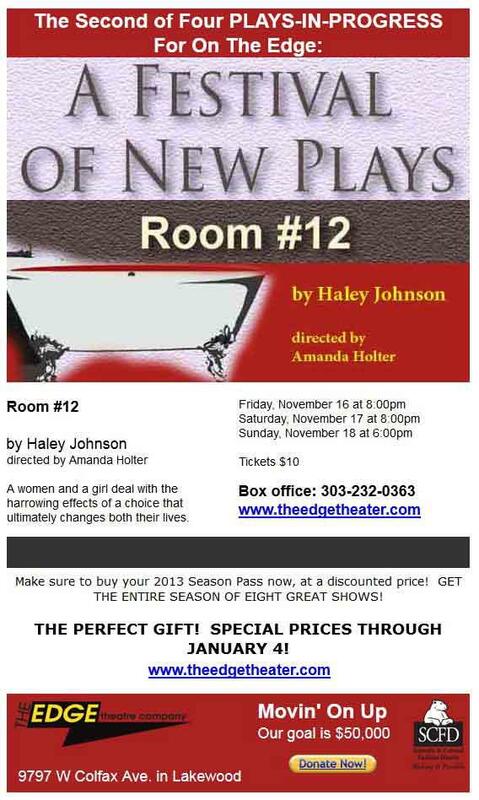 Opens November 15th at The Heritage Square Music Hall! 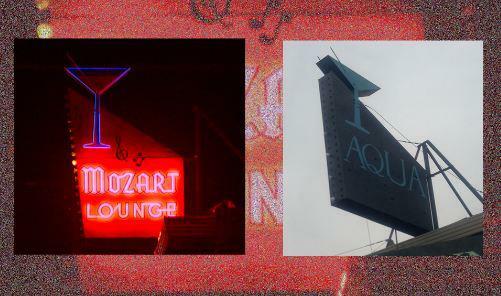 Save The Neon Signs on Colfax! 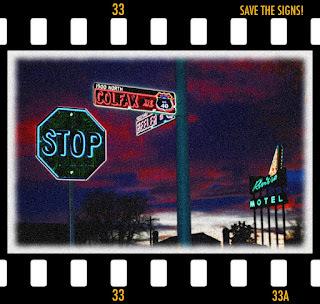 Join Colfax Jack's new campaign to save the classic neon signs that line Colfax Avenue. 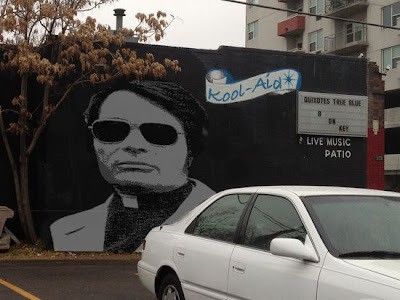 With gentrification and new businesses coming to the Colfax Corridor, we feel it is essential to maintain the signs that help to make Colfax Avenue so unique. If the signs do end up being taken down, we would like to see a gallery or museum created where these signs can be displayed for everyone to enjoy, instead of being lost to history. Join the cause on Facebook. 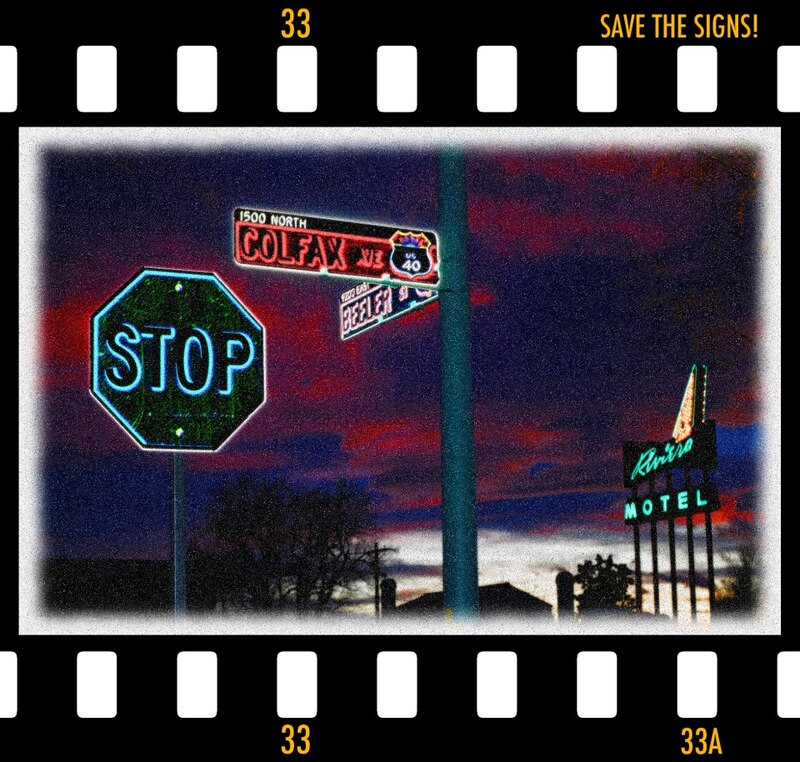 Save the signs!! If I haven't met you yet, I hope you will stop by Red Mango for a yogurt (on me) and a chat! I was so thrilled about the pretty new blue Greek Town street lights that were erected a few months ago...and their lack of light bulbs was no big deal for a while. But now, with the sun setting at 5pm and my business feeling the effects, I really wish the job could be finished quickly ... light bulbs and all! I wrote to Councilwoman Robb's office and one response is below. Should I just keep waiting, or do you think there are other "pressure points"? Who could I nudge to get bulbs installed before December? If you have any advice or other contacts for me, please do share! Could your office find out who is in charge of the new Greek Town Street lamps on the 2300-2700 blocks of East Colfax? They've been up for many weeks (maybe months?) but the bulbs have never been installed. I think better lighting will really help the businesses in the area, especially as the Denver Film Festival begins tomorrow, and the fall Daylight Savings change, with its much earlier sunsets, is just a week away. My shop, Twist & Shout, Tattered Cover, and the other family oriented businesses in the Lowenstein, as well as East HS, look forward to the new night-time lighting. I just received an email from her this morning saying that she is still working on it though. 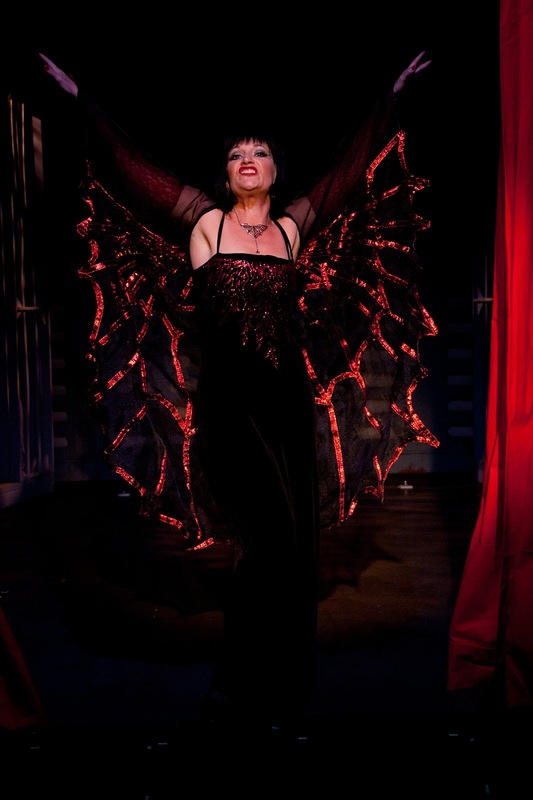 Vintage Theatre presents “Kiss of the Spider Woman,” starring Megan Van De Hey as Aurora, October 27 through December 2 at their new location in the Aurora Arts District at 1468 Dayton St., Aurora 80010. Performances are Fridays and Saturdays at 7:30 p.m. and Sundays at 2:30 p.m. Tickets are $30 ($25 advance) on Fridays and Saturdays; $25 ($20 advance) on Sundays; Students and Groups $20. 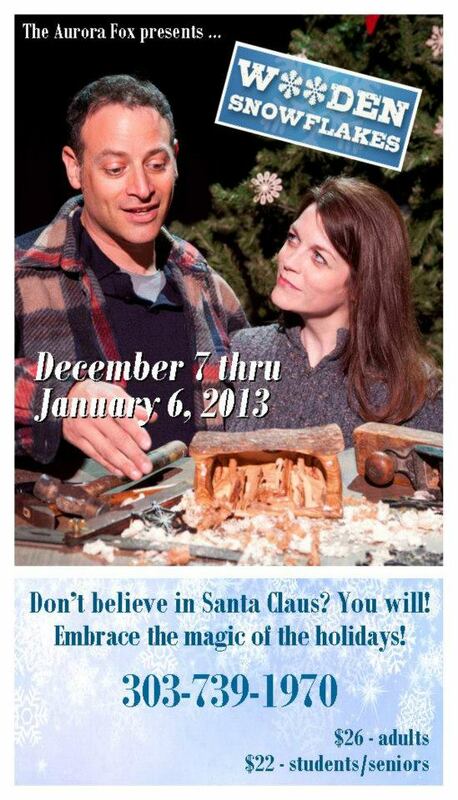 Tickets are available by calling 303-856-7830 or online at www.vintagetheatre.com. Live Nation presents KBPI’s ‘When Hell Freezes Over’ featuring Clutch at The Fillmore Auditorium on Friday, December 21. Special guest Texas Hippie Coalition and Special Guests TBA will open the show. 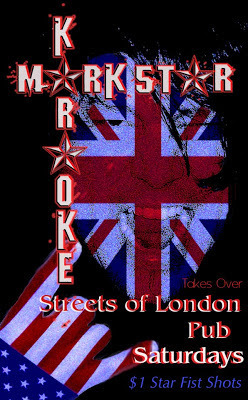 Show time is 7:30 PM. Doors open at 6:30 PM. Since 1991 Clutch have been challenging rock n' roll's limits with no signs of abandoning the unique experimentation that has defined them. Live, Clutch still own every stage they stomp onto. They remain a highlight at major festivals and music events worldwide from the UK's Download and Australia's Meredith Music Festival to Bonnaroo in the States. They were also a top act at the renowned Austin City Limits Festival in 2009. No matter what the forum, Clutch have cultivated a live show that can't be stopped. This past summer, Clutch released a new single, "Pigtown Blues" along with an acoustic version of "Motherless Child" (from their most recent full-length release, 2009’s Strange Cousins from the West). Earlier this month, Clutch announced that their tenth album Earth Rocker will be released in March 2013. Tickets are $34.50 GA ADV and $35.00 GA DOS plus applicable service charges. 40 West Artists Deliver another Exciting Show and Marketplace – with a Cornucopia of art treasures at Arts Harvest Festival. 40 West celebrates the annual autumnal splendor with the Fall Arts Harvest Festival & Exhibition. Part of Denver Arts Week, the three-weekend event includes dozens of artists displaying in a juried art exhibition, including a special themed gallery entitled “Van Gogh Goes West.” On Nov. 2 from 5-9pm, visit the exhibition for Know Your Arts First Friday and enjoy complimentary light refreshments and a performance by a woodwind octet from the Lakewood Symphony. On Nov. 10 from 10am-4pm, 40 West Arts District anchors Denver Arts Week with its Fall Arts Harvest Festival, a one-day-only marketplace offering art and artisanal goods, from over a dozen local artists, featuring handcrafted, one-of-a-kind unique designs. Check out a wide range of jewelry, hand-knitted gloves, accessories and toys; up-cycled textiles, antiques & collectibles, household décor, small art, photo and painting prints and more. Complete your shopping for holiday/hostess/birthday/’for you’ in one location. Meet the artists who created the wares they sell. Enjoy a series of fine art demos throughout the day to keep you inspired. Painting, stone sculpture, glass lampwork and more. Check out the Fall Arts Harvest Exhibition. The exhibit will also be open for 3 weeks in November, with regular hours Wednesdays through Saturdays, 12-4, from November 1-17. If you cannot join us for the 2 major events, we hope you can view the exhibit. All events will be held at 40 West Arts Gallery at 1560 Teller St, Lakewood, CO 80214. Please contact us a info@40WestArts.org with any questions. November 1-17 – Fall Arts Harvest Exhibition on Wednesdays thru Saturdays (12-4pm), plus additional hours as listed. Friday, November 2: “Know Your Arts” First Friday will have additional open hours 5 to 9pm and include a special performance by a woodwind octet from the Lakewood Symphony between 6:30pm - 7:30pm. Saturday, November 10: The featured event for the Denver Arts Week program will be the Arts Harvest Festival with small arts wares for sale, Saturday, November 10, 2012. 10am-4pm. Saturday, November 17: Last day to visit the 40 West Fall Arts Harvest Exhibition – 12 noon to 4pm. 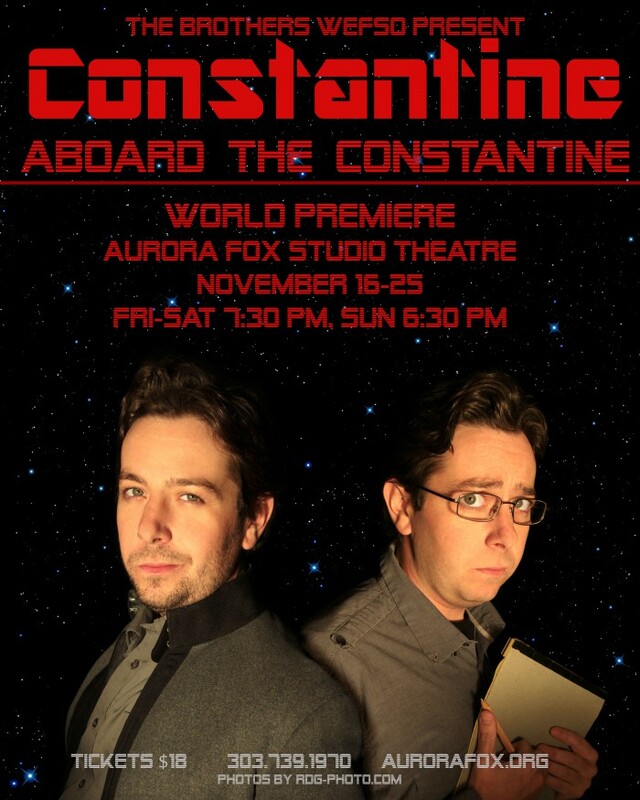 Brothers Wefso are proud to present the World Premiere of Constantine Aboard The Constantine, an original one-man show, from November 16th through the 25th, 2012 at the Aurora Fox Studio Theatre (9900 East Colfax, Aurora, CO 80010). 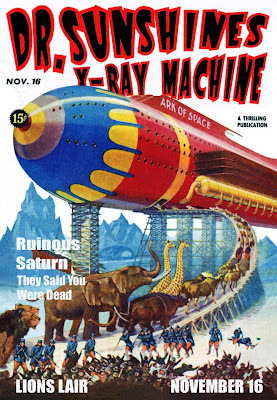 The Earth Ship Constantine is the largest, fastest, most ambitious star ship in the history of mankind. Capable of faster-than-light travel and designed for extra-planetary colonization, it spans 84 cubic miles and maintains a crew of over eight thousand individuals. Among these individuals are: Captain Jonathan Harrison, a headstrong and ambitious war-hero who pulled himself from the depths of poverty to become one of the most powerful men in the galaxy; and Private Abel Constantine, the quiet, black-sheep descendant of a family famous for daring exploits and selfless heroism. As ES Constantine embarks on its maiden voyage, it will forever change the lives of these two men, and transform them into the people they were destined to be. written by Charles Wefso, author of "The Dogs of Atwood." Also featuring Crystal Verdon Eisele, Stephen Siebert, Lauren Bahlman, and Mitch Slvec. Industry night to be announced. Primus 3D at The Fillmore Auditorium Tonight!